We commemorate the Feast of Our Lady of Sorrows on September 15, focusing on Mary’s spiritual martyrdom as Jesus’ mother, as expressed in her Seven Sorrows. 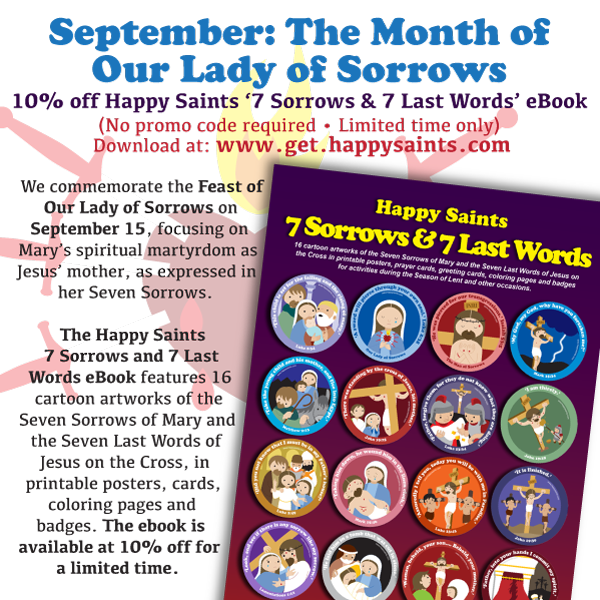 The Happy Saints 7 Sorrows and 7 Last Words eBook features 16 cartoon artworks of the Seven Sorrows of Mary and the Seven Last Words of Jesus on the Cross, in printable posters, cards, coloring pages and badges. The ebook is available at 10% off for a limited time.